Providence has a rich food culture. The desire for healthier, locally sourced, and sustainably processed food continues to drive structural change in the food industry. For example, organic food is a high growth market – in the US sales have increased at least 10% year-over-year for the last 25 years and this pace is expected to continue. The City's Urban Food strategy positions Greater Providence’s vibrant food ecosystem squarely in this high growth market. The strategy is focused on light food manufacturing, distribution, startups, food tech, and urban production. From innovative food companies, to tasty microbreweries and delicious dining Providence is a foodie town. 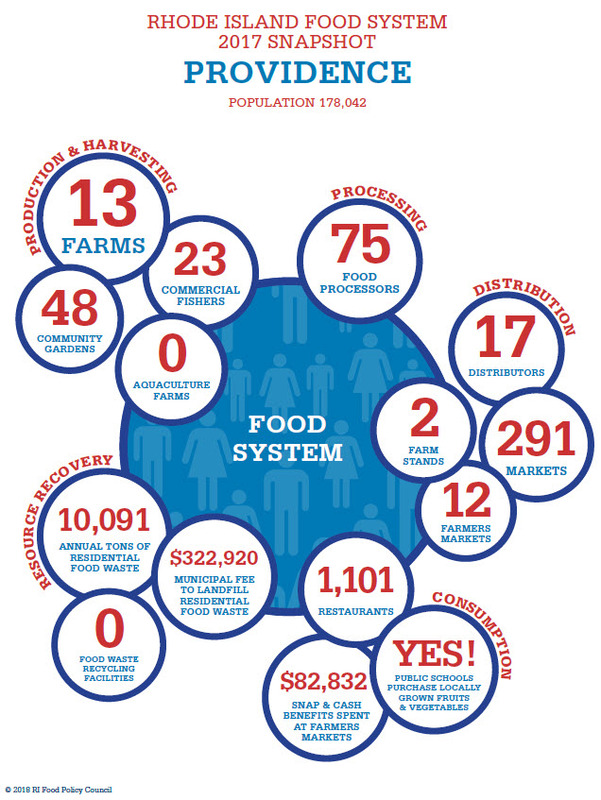 The Urban Food strategy capitalizes on the Providence’s core competency in food and new opportunities arising out of the deindustrialization of food. In light of this trend, Providence is now a competitive place for moderate size food processing firms to grow. The city offers affordable rents, and water and utility rates. It is within 200 miles high value producers and markets, and it is home to a talent pool with diverse and applicable skill sets. Parts of the food system are starting to deindustrialize. For some time, food processing has been located close to large-scale producers. Demand is rising for regionally and locally sourced food with shorter and more transparent supply chains. The model of geographically centralized production and processing is losing favor and market share. and is in good standing with the City and State and you believe it should be listed here please contact us. Pilotworks is Providence's premiere shared kitchen and culinary incubator. We are empowering the next generation of food entrepreneurs helping them bring new companies and ideas to market. UNFI has been Moving Food Forward for over 40 years, every day delivering healthier organic, natural and specialty food options to more people throughout North America. We Discover What’s Next—energizing tomorrow, guiding a healthier road ahead. Learn by doing, mastering the craft of culinary arts in JWU’s College of Culinary Arts top-notch labs, under the guidance of expert chef-instructors. Social Enterprise Greenhouse is a network of business and community leaders who contribute time, expertise and money to create jobs and support positive social change through social enterprise.